It does give you the basic construction technique, once you learn that you can adapt it to make an HST in ANY size that you want! It does give you the basic construction technique, once you learn that you can adapt it to make an HST in ANY size that you want. 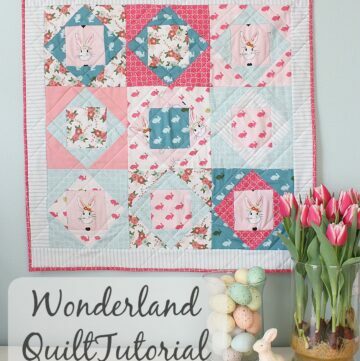 -You need 2 squares of fabric that are the same size in two different prints. 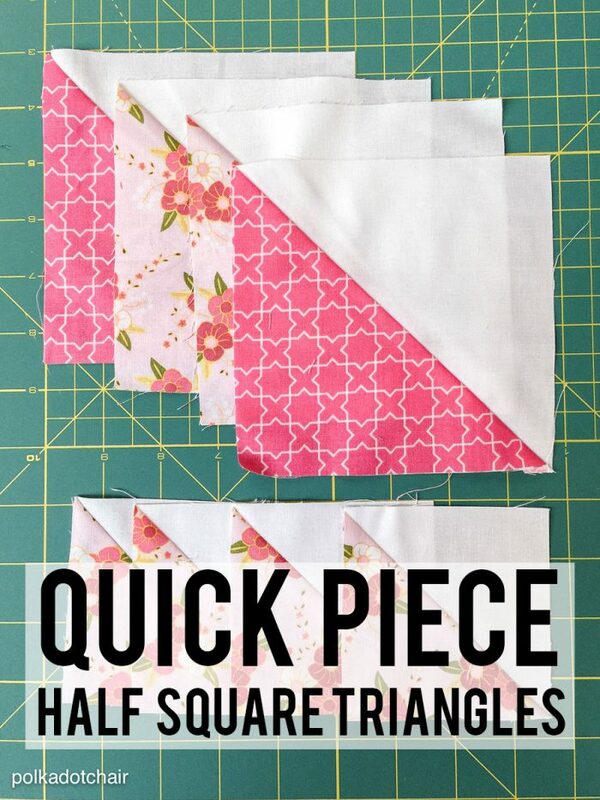 -2 squares of fabric will yield 2 HST blocks. 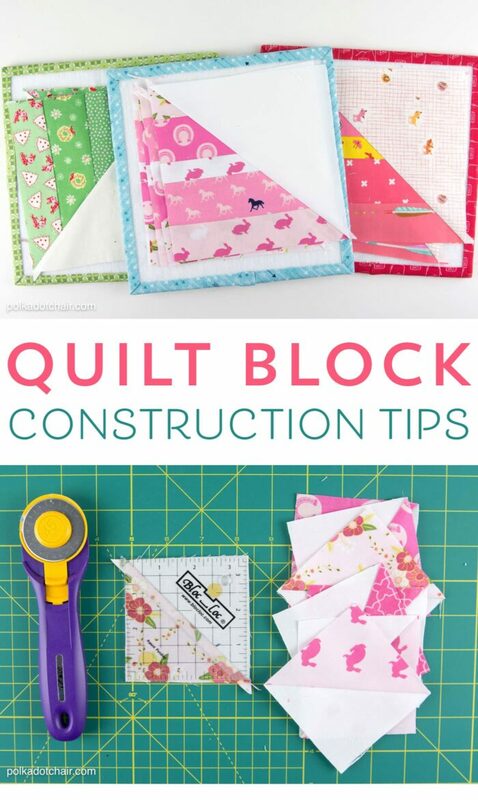 -As you create and trim your HST blocks, you will lose 1/2″. For example. 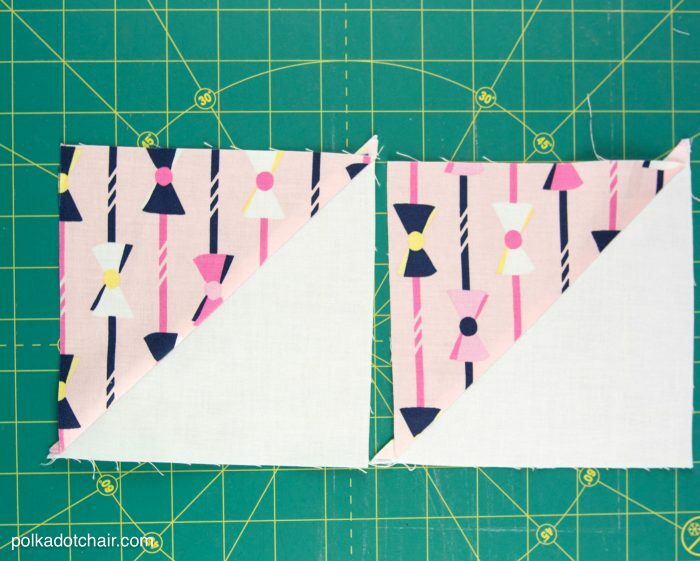 two 7″ x 7″ squares of fabric will yield you two 6 1/2″ x 6 1/2″ HST blocks. When those HST blocks are sewn into a quilt they will be 6″ x 6″ finished blocks. 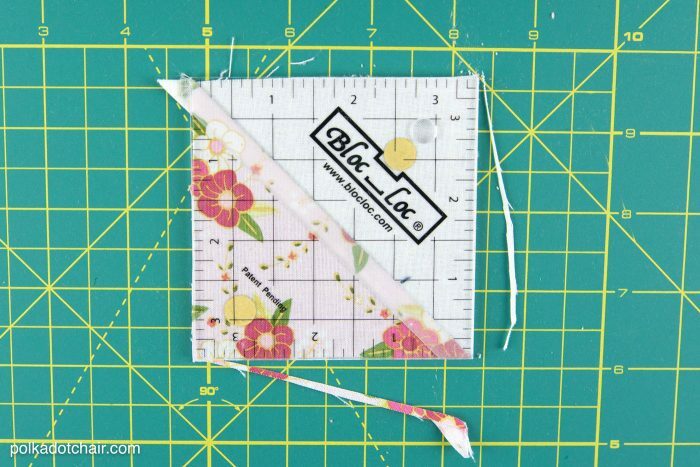 Begin by marking a diagonal line on the wrong side of one of your square background pieces using a fabric safe marking pen (I use Frixion Pens). Place it right sides facing on top of the 2nd square fabric piece. 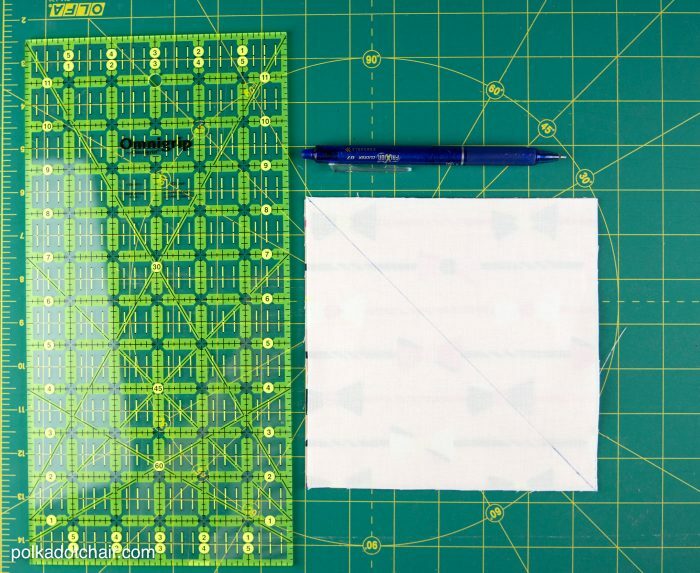 Stitch down each side of the marked line, exactly 1/4″ on each side of the center line. 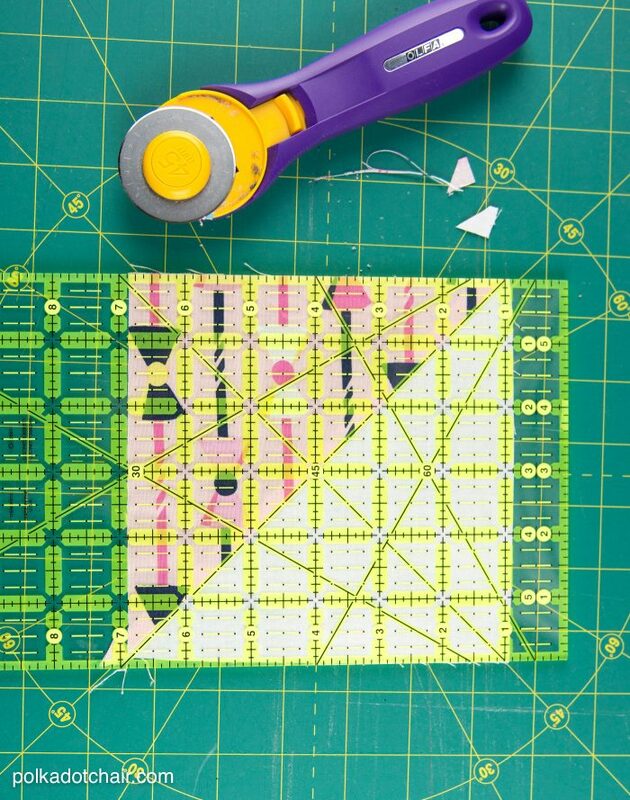 Using your quilt ruler and rotary cutter, cut along the drawn line. You will have 2 pieces that look like the photo above. Press the pieces with the seams going towards the darker fabric. Be careful not to distort the shape. 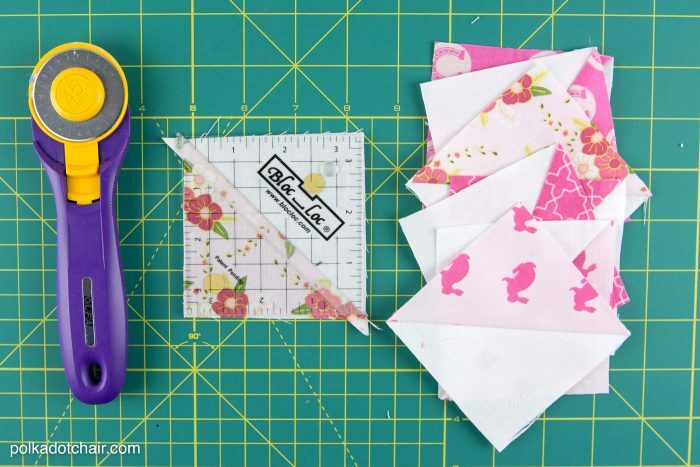 Since the fabric will distort as you sew and press it, it is necessary to square up and trim your HST blocks before you proceed. 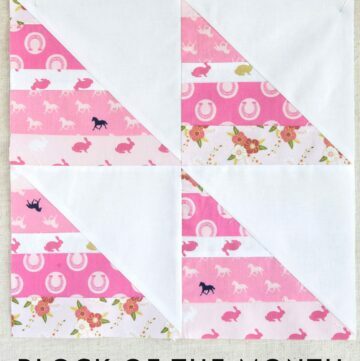 To do this I like to use Bloc Loc rulers.. 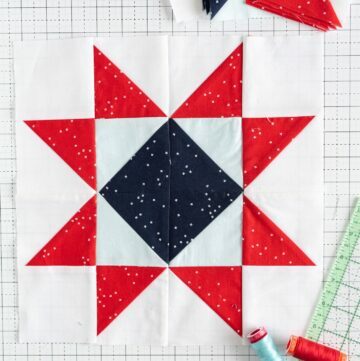 They have a groove down the center to keep your block straight as you trim. The only downside is that they come in specific sizes. I have purchased the rulers in 5 different sizes and find that I use them over and over again. 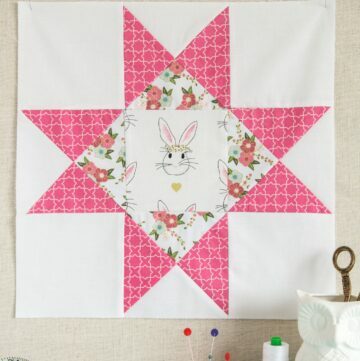 I also like to use the Quilt in a Day Half Square triangle ruler. With this ruler, you square up your triangle BEFORE you press it open. It also is easier to use when you need many sizes of HST’s. You can get this ruler HERE. 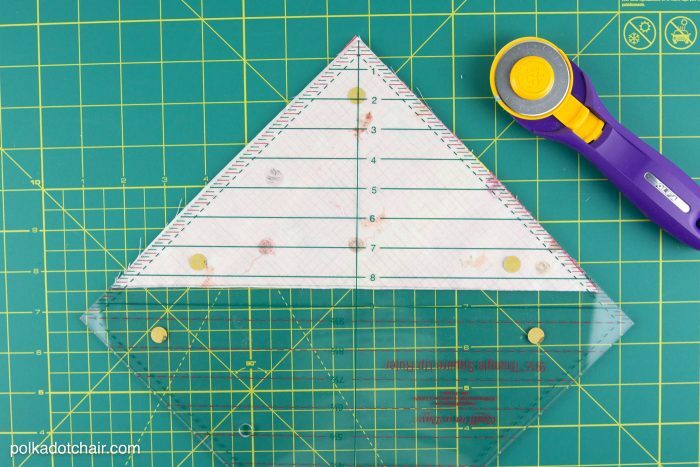 You can also use your quilt ruler by lining up the seam of the block along the 45-degree angle mark on the ruler. That’s it, pretty simple HUH!?? Just make sure that you are always careful with your measurements and you don’t distort the seam as you press. 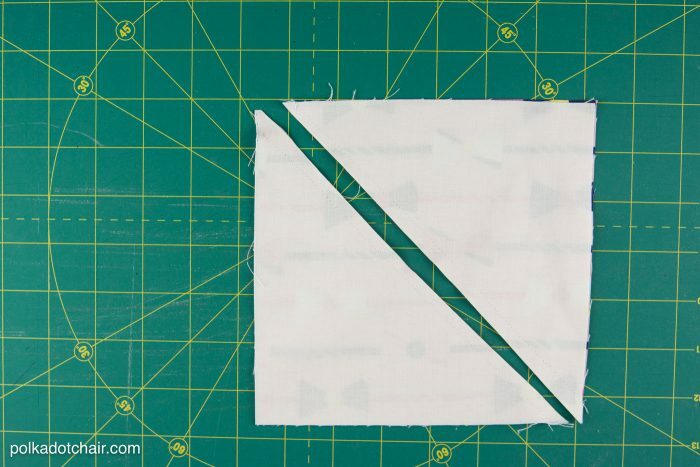 Since the seam is on a diagonal it can easily distort since fabric stretches across the bias.